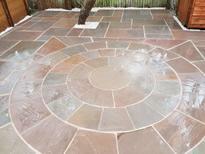 A typical starter patio could be laid with regular shaped paving slabs (for example 450×450mm or 600×600mm). 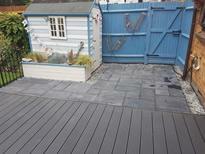 This simple type of patio can be a surprisingly cost effective way of making a sensible start to your garden. 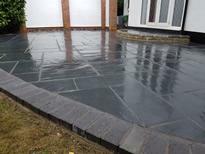 Those of you with a little more to spend may prefer Yorkstone paving. Yorkstone paving comes in irregular shapes and sizes, which, when laid, produce a staggered and attractive form of paving. Imitation Yorkstone is a particular favourite with Stone Valley customers. It provides the same effect as real stone, but at a much reduced cost. 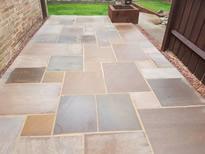 Indian Sandstone is also a very popular choice with our customers and is laid with a similar effect as the Yorkstone - but has a very different and smoother texture. If you really fancy something different for your patio we suggest that you take a look at the hugely impressive Timberstone range. These are concrete moulds that have been made to look exactly like timber products! The concrete “Railway Sleepers” are highly recommended (see photo gallery below). Another very popular type of patio is one with a built-in water feature. The patio market has expanded vastly over the last decade, so you are now really spoilt for choice as far as products are concerned. For even more ideas, please take a look at the Stone Valley suppliers page (see below). Here you can browse patio products and be directed to our suppliers websites. We work in Ascot, Bracknell, Maidenhead, Reading, Sunningdale, Virginia Water, Wokingham and the surrounding areas. Our patio photo gallery features just some of the many different patios we have provided for our customers.